Do you dream of owning your own home, but feel like you’ll never have the money for a down payment? While saving for a down payment can seem like a daunting task, it isn’t impossible. In fact, there are ways to begin saving right now that won’t put a crimp in your lifestyle. Here are the best sneaky ways we’ve found to save money for that down payment. We’ve gotten so accustomed to paying with credit and debit cards, having cash on hand can seem like a real hassle. But it’s so easy to spend more than you think you are when you’re swiping that card. Instead, opt to pay with cash. You’ll have a better sense of how much money you’re actually spending, and will spend less on impulse purchases. How much food do you end up throwing away in a typical week? If it’s more than you’d like to admit, perhaps it’s time to curtail those food expenses. In fact, according to the National Resources Defense Council, the typical American wastes a whopping 40 percent of the food they buy. Think of how much money you can save by only buying what you can actually eat. As the temperatures rise over the summer, you may be tempted to crank that AC. But think about how much extra money you’re spending just to lower the temperature by a degree or two. If you have a programmable thermostat, set it so that the house is warmer while you’re away. Keep curtains closed on sunny days. According to the Department of Energy, you could save up to three percent on your energy bill for every one degree you change your thermostat. Help yourself get into the savings mindset. Instead of only saving what you have left over from your paycheck each month, decide how much to save in advance. Then set up an automatic transfer from your checking to your savings account, and watch the dollars add up. Is it really necessary to have the latest phone or wear the newest clothing trends? See if you can resist the urge to go shopping for new things. Instead, make do with what you already have or shop second hand. You’ll begin to see that not only will you save money, but you’ll also be happier as a result. It’s exciting to see your savings grow as you edge closer and closer to your goal. If you’re buying a house with your partner, why not introduce a little friendly competition? This is a great idea, especially if one of you is very competitive. 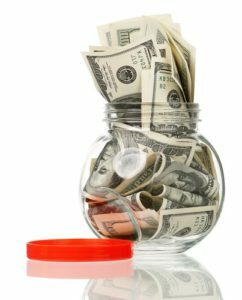 Have weekly challenges to see who can save the most money or the largest percentage of their paycheck. The loser each week then makes dinner for the winner. Did you get that gym membership hoping it would inspire you to exercise more often? If it’s just sitting there unused, then cancel it. The same goes for magazines you don’t read and any other recurring payments for goods or services that aren’t meaningful to you. While those celebrity tabloids can be fun to read, by giving them up you’ll realize your dream of home ownership a little faster.